After being so envious of all the amazing bags on Instagram featuring glitter vinyl and fancy metal rivets, I’ve finally upped my game! 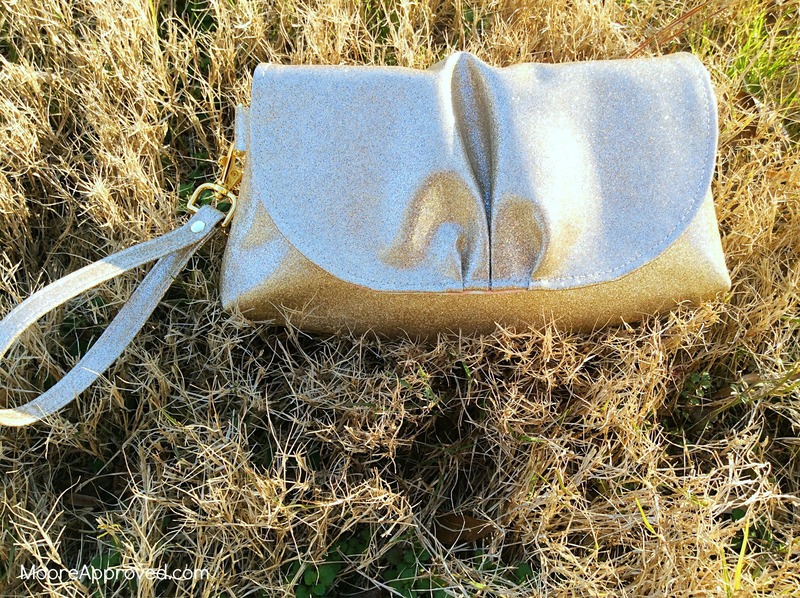 This super adorable clutch was made from a free pattern by Charmed Liebling – the Pink Peony Bag. I’ve seen this bag floating around Pinterest for such a long time, and had filed it away in the back of my brain in the “someday” category. The pattern was surprisingly easy, and only took about five hours to make from start to finish. (That’s considered speedy for me!) Now that I know what I’m doing, it might take about three hours for future repeats. Quite a few other bag makers recommended MiKri World Glitter Mirror Canvas Vinyl, so I ordered four rolls to try it out for myself. Each roll is 12 x 54 inches and costs $8.25. Shipping was quick and approximately $5. The Glitter Mirror Canvas Vinyl was easier to sew with than I expected, and it is indeed thinner and more pliable compared to other types of vinyl and faux leather. According to the website: Glitter Mirror Canvas is full color glitter canvas with a very thin layer of vinyl (PVC) on top – retaining high sparkle as it is not glitter mixed in vinyl, but rather vinyl OVER glitter. It can be washed in cold water on gentle or hand washed and air dried. While I’ve read recommendations to use a Teflon foot or putting tape on the bottom of a regular foot, I didn’t do either – just used the integrated walking foot on my Janome 7700. Instead of using pins, I used Clover Wonder Clips to avoid poking holes in the canvas vinyl. 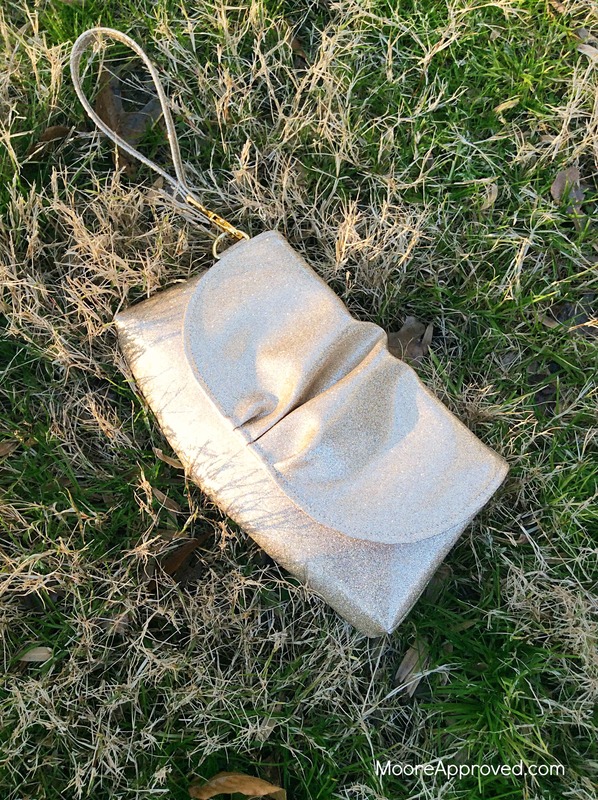 The product stayed intact during the bag construction. There are pleats on the purse front flap, and I did take my time on that section to make sure the end result was aesthetically pleasing. Loving the fact that using canvas vinyl means skipping interfacing or stabilizer! Depending on the pattern, that can equate to a significant time savings. Woo hoo! To make the wrist strap, I used the standard method of folding both edges to the middle – it ends up being four layers total – which my sewing machine had no trouble stitching. 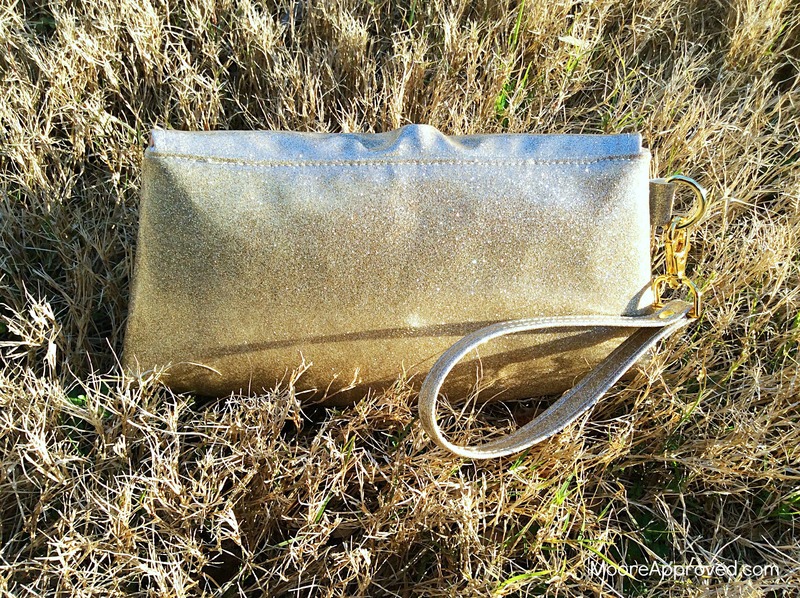 The gold hardware is from an Etsy shop called Purse Supplies R Us – shipped from the U.S. with reasonable shipping costs. To fasten the wrist strap, I used a rivet for the first time! To do this, I used supplies all from Tandy Leather. (Rivets, poly mallet, rivet setting kit, rotary leather punch) While at the store, a helpful associate took the time to give me a crash course in rivet setting. That really helped take away the intimidation factor, once I saw how simple it was. At home, I did practice on some glitter vinyl scraps – then moved on to the “real thing” and nothing traumatic happened. A major plus! 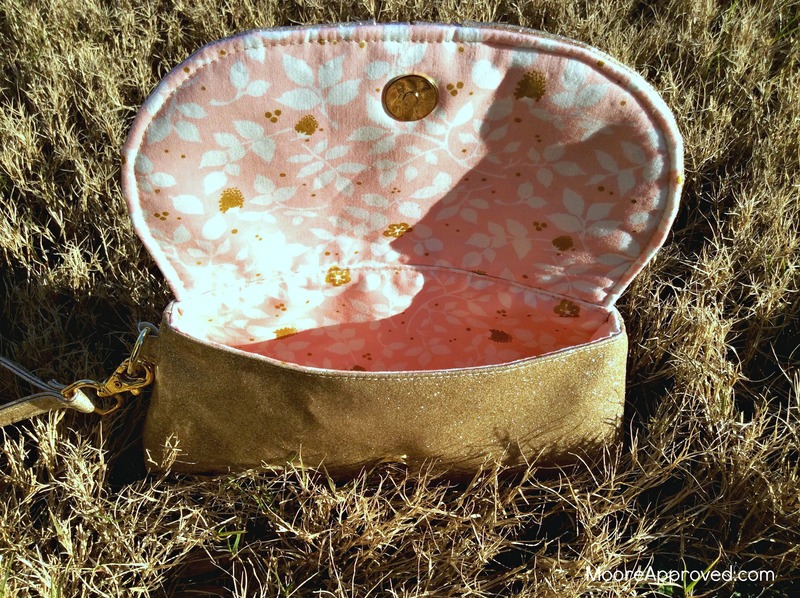 The end result of the Pink Peony Bag using glitter mirror canvas vinyl is fan-freaking-tastic! While it used less than $15 worth of materials, it looks like such a high end fashion accessory – I almost can’t believe it. Now I know what all the fuss is about, and I’m officially drinking the glitter vinyl sparkly Kool-Aid. One Response to "Review: MiKri World’s Glitter Mirror Canvas Vinyl & Free Pink Peony Bag Pattern"
Love this!!! I really need to get my hands on some of that vinyl. Great job! !